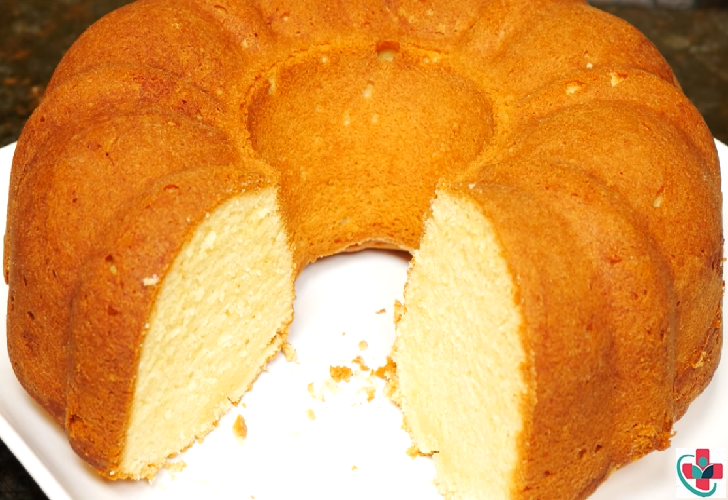 Make a Perfect Pound Cake, moist and buttery. This is a big cake and serves a lot of people since a small piece will be satisfying. I like the classic, simple look of this pound cake. But if you want to glaze it, mix powdered sugar with a little milk or lemon juice and pour over top. It’s important that all the ingredients be room temperature and not ice cold. The butter should be left out of the fridge until soft. I leave the eggs and sour cream out until they lose their chill. The batter will come together easily if all the ingredients are room temperature. Put the soft butter into a mixer. Save the wrappers. Cream the butter on medium speed for 3 minutes. Scrape down the sides. Cream on medium for another 2 minutes. Add the sugar and cream for 3 minutes. Scrape down and cream for another 2 minutes. Add the eggs one at a time. Wait and make sure each egg is fully incorporated into the batter before adding the next. Scrape down and add the sour cream. Now add the vanilla extract. Scrape down again. Add the flour mixed with 1sp salt - little by little so there are no lumps. Scrape down, all the way into the center where flour can hide. Mix for a few seconds and the batter is ready. Here’s where the butter wrappers come in handy. I always use them to butter my cake pans. Get in every crevice of the pan you're using - I'm using a bundt pan. Put a little bit of all purpose flour in your bundt pan, turn it around to coat the whole pan. Tap out the excess over your sink. Now that the pan is evenly coated, you’ll have no problem getting the cake out, it’ll literally just fall out in one piece. Spoon the batter all over the pan. Spread it out evenly. Tap the pan on your counter a few times to get rid of any air bubbles. Bake this cake in the center of a heated 325°F or 163°C oven. It’ll take about 1 hour and 10 minutes. Some ovens run very hotly, so I suggest you check the cake after 1 hour and cook for a few more minutes if you need to. The cake is ready when you insert a toothpick and it comes out clean or with a few crumbs. As long as there is no wet batter on it, it’s cooked through. The edges of the cake will come away from the side of the pan, that’s another sign that the cake is cooked. The cracking on top is normal with pound cakes. Cool the cake on a rack for 45 minutes. After 45 minutes, the cake is still warm but we can turn it out. Take an offset spatula or butter knife, gently pull around the edges. Turn it over. Let it cool completely on the rack. The bottom of the cake is domed, if you want a perfect, flat bottom, slice off a thin layer from the bottom with a serrated knife after the cake is cooled. When the cake is cool, cut with a serrated knife. Slightly crispy on the outside, beautiful crumb. Moist and delicious.